Schumi0101: Mumbai to Bangalore in Sharma I-Shift. Mumbai to Bangalore in Sharma I-Shift. With my brief visit to Mumbai coming to an end, it was time to say good bye to ‘Aamchi Mumbai’ and head back to ‘Namma Bangalooru’. However with tickets to Bangalore yet to be booked, Saurabh and me embarked upon the ticket hunting journey. First stop VRL. Though VRL was an outright choice, the timings were a little off beat and I was a little skeptical to try their service. Next stop a veteran on this route, Sharma Transports. Saw their Multi Axle I-shift resting outside their office and needless to say, I almost made up my mind at that very moment to book my tickets on this service. However I still tried for tickets at SRS travels, but their next service was at 8pm. 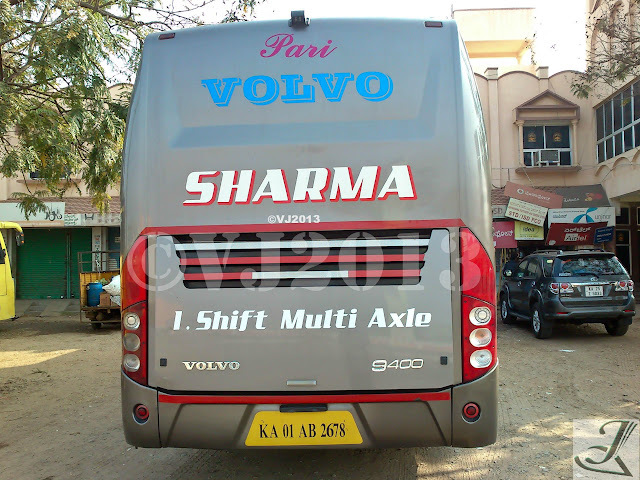 Finally after running around the streets of Mumbai, I booked my ticket on Sharma’s I-shift multi Axle. My tryst with Sharma’s Multi axle I-shift buses goes a long way. I was amongst the lucky guys who were present at the right place at the right time when their second batch of I-shift multis were delivered last year in Bangalore. Ever since then I always wanted to travel in an I-shift and finally the time had come to travel in this bus. I booked a window seat (No 36) and decided to board the bus at National Park, Borivali. While booking my tickets, I was told that the departure time at Borivali National park was at 19:00hrs and the driver’s number was given to co-ordinate (if required). Saurabh ensured to drop me before the scheduled time of departure and we waited for the beauty to show up. Finally at 19:15pm she showed up. 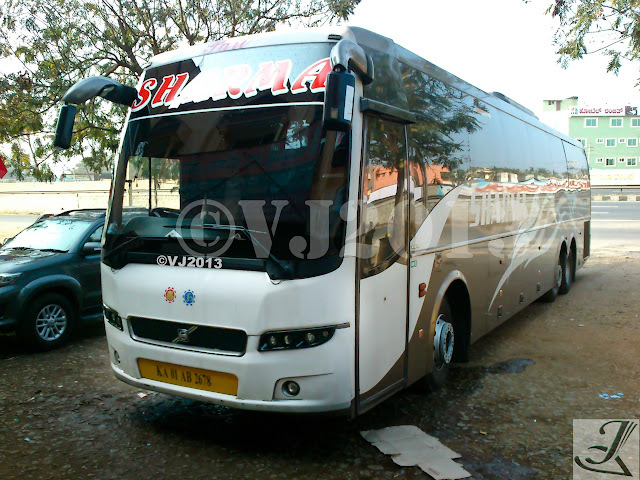 This bus was from their first batch of I-shift Volvo bus. The exteriors looked a little faded however the interiors looked brand new. For some reason the carpet inside the bus was missing. No sooner I boarded the bus, she began to move. Since my cellphone’s battery was very low, I plugged in the charger in the socket however it was not working. I went ahead and requested to driver to switch on the charger controls as I had to make some urgent calls back home. The driver said he would do the same in a little while. The bus reached Sion and stood for a couple of minutes to load up parcels. At this point of time, I received a call from home and while I was on the call my cellphone switched off. Finally, I went up to the driver and asked him to switch on the controls or handover his cellphone as I had to make an important call back home. The driver gave me an angry look while the cleaner switched on the charger socket controls. Not the start I was expecting..!!! After rubbing the shoulders with the crew, I took my seat and started settling down. The leg space was little less than expected. Though the bus was a B9R I felt the engine noise was slightly different however, the ride quality was same as any other B9R. One could easily sense the smooth shift of engine noise when the bus automatically changed the gears. Fortunately, the Sunday evening traffic at Mumbai was less and the bus made its way to Kalamboli. We picked up most of the passengers here. The bus was full with a small amount of passengers getting down in Pune. The cleaner came over and handed 1ltr water bottles to all Bangalore bound passengers. A Japanese/Korean movie (not very sure) dubbed in Hindi was loudly being played on the entertainment system. Though it was an action movie, it more or less sounded like a comedy movie to me  We entered Mumbai-Pune Expressway and the driver finally flexed his muscle. 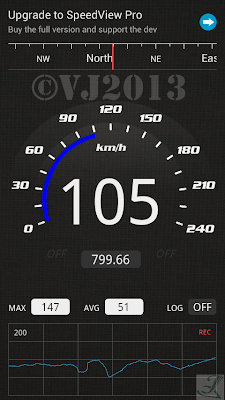 The bus was constantly doing speeds close to 104kmph and at one point it reached top speeds of 110kmph. The bus was driven exceptionally well in the ghats. Just before we exited Mumbai-Pune Expressway, we pulled over for our Dinner. The place looked a little shabby from the outside however it was better inside. The service was commendable and food was quite ok but not over priced. After the break we resumed our journey and we reached Wakad at around 00:15hrs. Most of the Pune bound passengers got down here. Few more passengers bound for Bangalore got in here and we continued on. 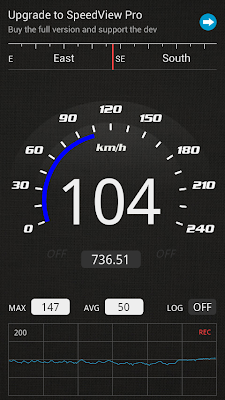 Finally I decided to get some sleep and while I slept I could still feel the bus doing great speeds. When I woke up the bus was cruising near Chitradurga. We overtook a VRL B9R, not sure from where it was coming from and finally pulled over for our breakfast break at 7:30am. A Neeta B9R and National’s ‘Saawariya’ was already at this place. ‘Saawariya’ was the first one to depart towards Bangalore followed by Neeta. 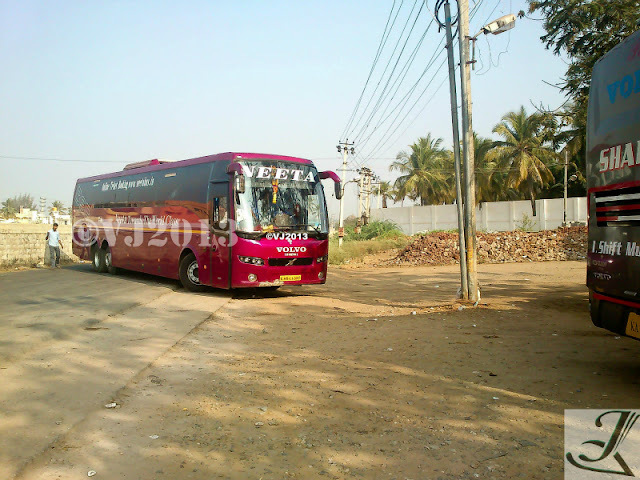 Our bus stopped for 45mins and during this time a Rajahamsa bound for Davangere joined us followed by a VRL’s Ashley. We finally departed at 8:15am and as usual the bus maintained great speeds. We entered Tumkur to drop some parcels and few passengers. We finally reached the Yeswanthpur- Nelamangala toll way. Since the bus goes to Anand Rao circle via Kaveri junction, I decided to get down at Gorguntepalya. We reached Gorguntepalya at exactly 12:15pm. Initially while booking my tickets at Mumbai, I was told the ETA in Bangalore would be at 13:30hrs depending on the traffic. 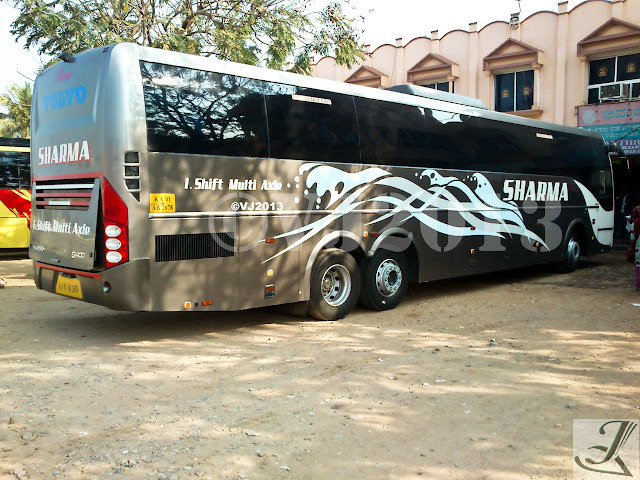 But I reached home by 13:00hrs, such was the service provided by Sharma Transports. The time management was exceptional. 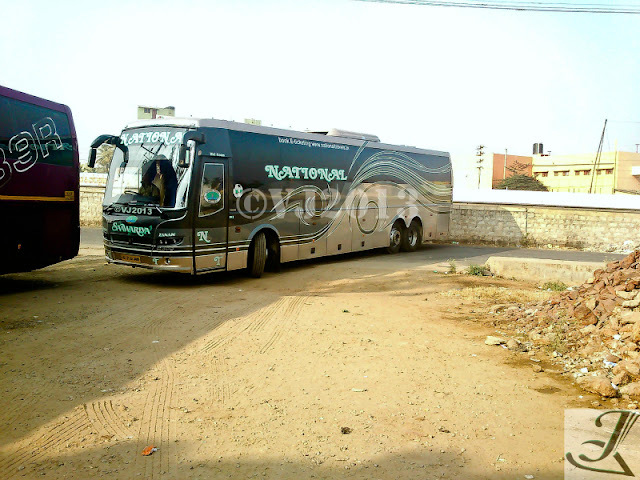 The bus took exactly 12hrs to reach Bangalore from Pune. Though I had a sour time with the crew during the initial phase of the journey, the crew was extremely helpful and courteous all along the journey. Thanks to Sharma Transports my desire for traveling in an I-shift was quenched. Traveling through the best Travels Bus is really a wonderful experince that every passenger would feel. it should be a great Travel for them.